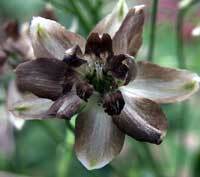 A shadowy English delphinium in deep, dark shades heads the pack of new ebony plants. Delphinium elatum ‘Chocolate’ has real garden impact. Its flower spikes reach 6 to 8 feet high, bloom June into July and again in the fall. The flowers are a chocolate-sundae blend of colors from cherry pink through cream to semi-sweet chocolate tones. And what would spring be without yet more coneflower cultivars? Two sound like stand-outs: Echinacea purpurea ‘Jade’ from Log House Plants in Oregon has bright white petals with green centers surrounding the namesake cone. The daisy-like flowers, long-lasting in bouquets, are lightly scented on strong 3- to 4-foot stems. For a blast of color, choose Echinacea ‘Tiki Torch,’ billed as more vigorous than many of these newer coneflowers, with oversized blooms in vivid pumpkin-orange. No other perennial blooms over a longer period than wallflowers, or is more of a magnet for bees and butterflies. 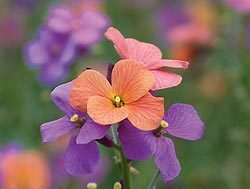 Found on the west coast of Wales in 2001, Erysimum ‘Jenny Brook’ has multicolored flower clusters in shades of pink, peach and lavender. Corydalis ‘Berry Exciting’ (I feel like apologizing for some of these names!) is a ferny-looking little perennial with luminous yellow leaves and spurred purple flowers. It’s fragrant, takes full sun to partial shade, and — unlike most corydalis that go dormant in summer — promises both leaves and flowers that keep going all summer long. 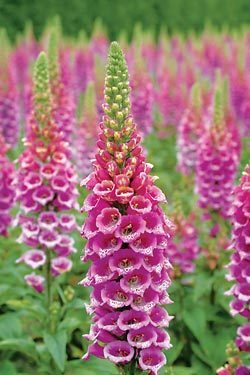 The official name of this new foxglove is Digitalis purpurea ‘Candy Mountain.’ But when breeders recognized the plant’s unusually strong upright structure, plus its upturned flowers (unusual for a foxglove) they couldn’t resist nicknaming it “Viagra.” Don’t you need to add one to your garden just so you can tell that story?